Up to now the News in ShareScope has been separated into two distinct parts. 1. The locally stored news, which was stored on your hard drive, and was accessed by pressing (\) Backslash for the news for a share or Shift+Backslash for all of the news. 2. The News Archive, which was stored on our servers, and was accessed by pressing Ctrl+N for the news for a share or by selecting	View and News Archive (all Shares) for all of the news. 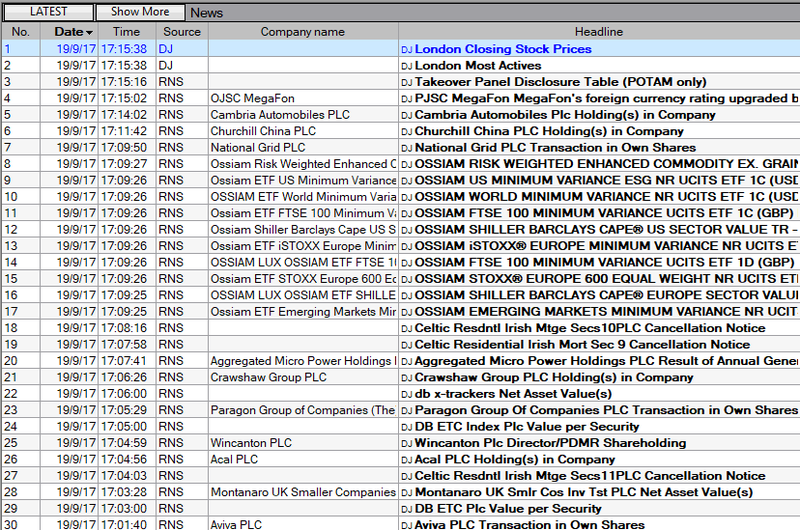 The LSE Regulatory News Service (RNS) news was only accessible via the News Archive. This meant that it was not possible to set alarms on RNS stories and the News flags that can be placed on tables and charts etc would only work on stories from the Dow Jones news service. From version 7.4.0 the has now changed. Our developers have been busy fully integrating the news shown in the	News Archive into the program. This means that RNS news stories will appear in the normal news views and they will trigger alarms and be recognised by the flags on charts and tables. Note: Now that the news archive has been fully integrated into the program the old locally stored news has been removed from the program completely. In addition to this the news archive no longer exists as a separate function. We have also taken the opportunity to incorporate new functionality within the News function as well. Ctrl + N : In ShareScope Gold works the same as Backslash. In ShareScope Plus and Pro this will open a new News window showing the news for the selected share. The first thing you may notice are the two new buttons at the top of the news window. 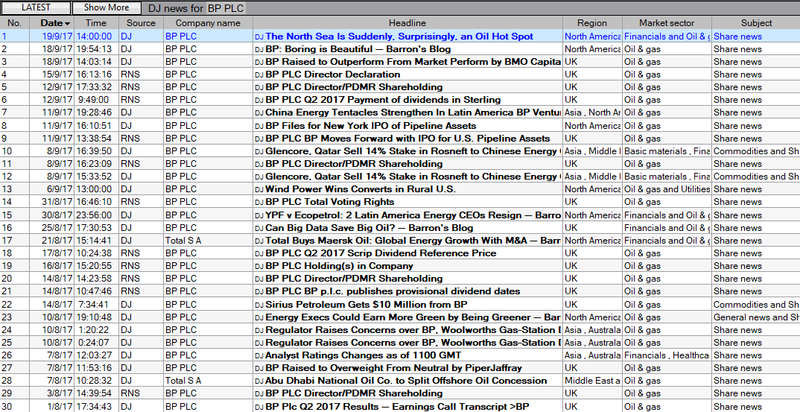 When the news is first loaded there are a predefined number of stories that are shown, by default this is 50. In order to see more stories you can click on the Show More button. If a scroll bar is visible on the News window then scrolling with the mouse wheel will also load more stories. Pressing the Spacebar will advance you down the list, when you reach the last story in the list pressing the space bar will load more stories for you. When you click on the Latest button a date picker will open. From here you can select a date and load the news on that date. Once you jump to that date the Latest button will change to show the date you chose to jump to. To return to the current date you can click on the button and click on Latest in the dialog window. The Show More button also changes so that you can load	More (older) news and More (newer) news. In the News view you'll also be able to see that the	Headlines for the stories are in bold. This indicates that the story has not yet been read. Once you have read a news story the Headline changes to normal text. If you right click on a story then you'll note you can change the story from Read to Unread and vice versa. If you cannot see all of the text in the Headline column you can move the mouse over the text and a box will appear showing all of the text. Dow Jones, our news provider, has flagged this news as 'Hot' to indicate they believe it is more important than other stories. When you open a new story the window now looks slightly different. 1. The header in the new version has been hidden, there is a tick box to show the header at the bottom of the window. This is deselected by default. 2. The font and headline colour have changed slightly. 3. Highlighting of the share's name has been improved. This gives you an additional search function that can be used to search the story shown for a specified word or phrase. 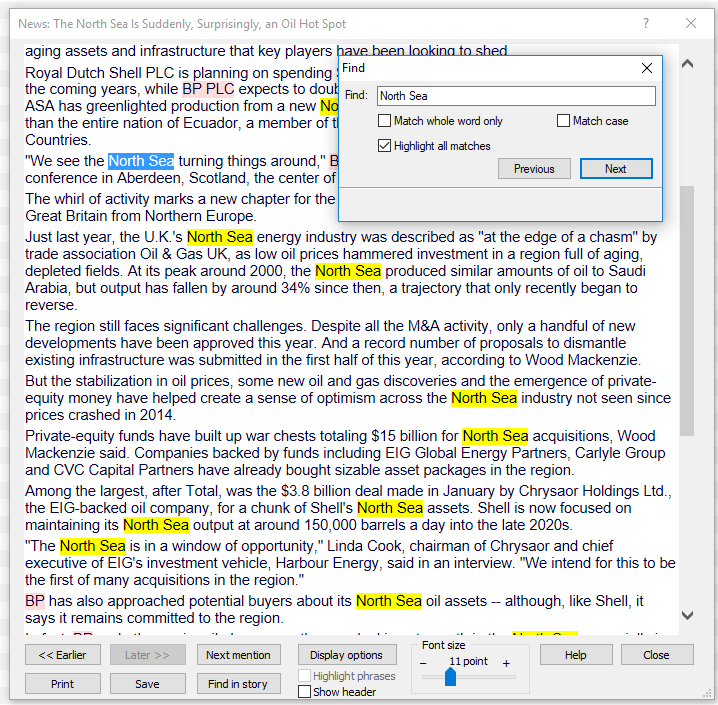 All words or phrases found by this function are highlighted in yellow. You can use the Next and Previous buttons to step through each instance of the word or phrase. Note the option	Match whole word only and Match case tick boxes. The first two options, much like Find In Story above, allow you to highlight certain key phrases in the story. However,	Find In Story is temporary and only looks for a single word or phrase. 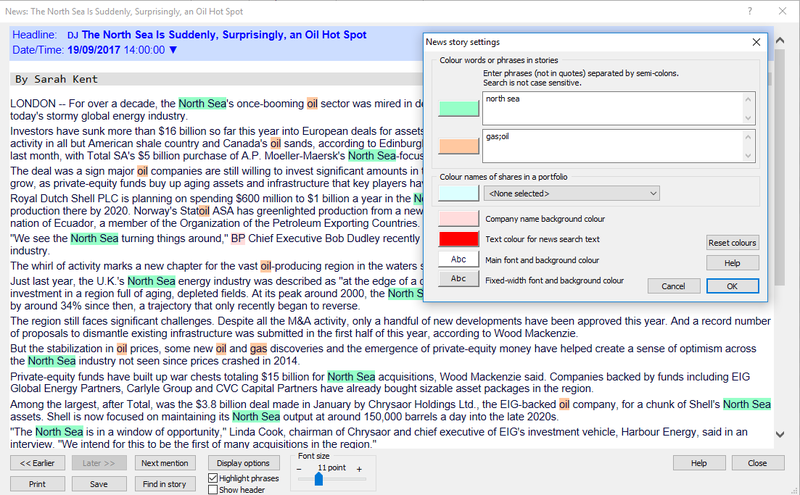 In this case the highlighting applies to every story you view and you can enter multiple words or phrases. Note: each word or phrase has to be separated by a semi-colon (;). This means you can use commas in the phrases should you wish. In this case we have entered 'north sea' in the first field and 'gas;oil' in the second field. You can see the individual phrases being highlighted in the story shown in the image. 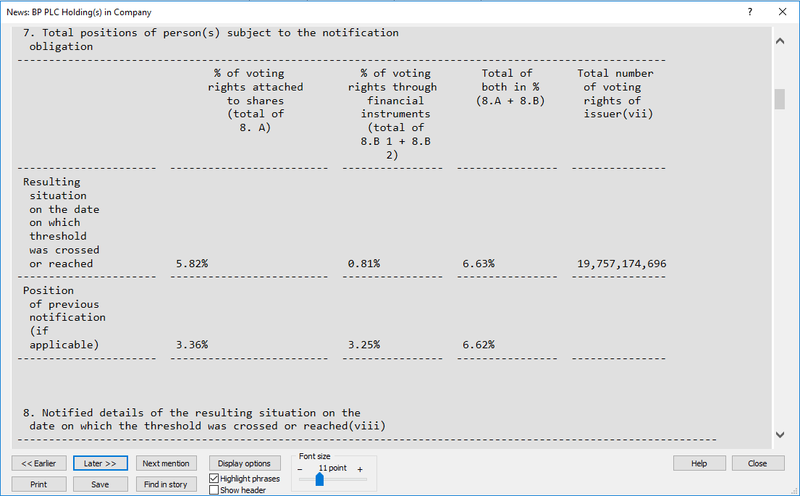 The third option allows you to select a Portfolio and will highlight the names of any of the shares in the portfolio if the name appears in the news story. 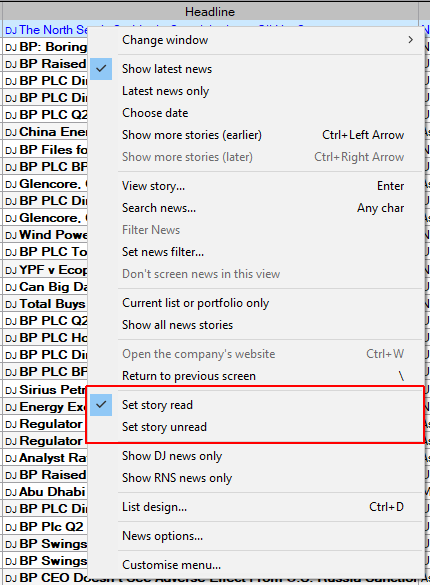 Here we have added Royal Dutch Shell to the Example portfolio in order to show how the highlighting works in the new story. 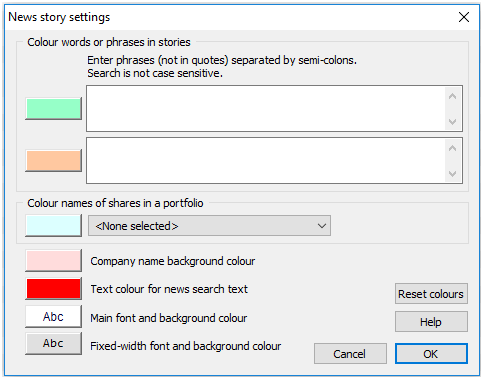 The next three options allow you to change the	Company name background colour which we have already discussed, the Text colour for new search text, which we will cover in the next section and the	Main font and background colour, which should be self explanatory. The final option allows you to change the	Fixed-width font and background colour. Some news stories contain sections which have a fixed width, usually because they are presenting data in a table format. This is an example of fixed width news taken from a news story from BP. When looking at the new view, either for a share, a list or all of the news, you can apply a search to the news simply by typing the word or phrase you wish to search for. As soon as you start typing the News search dialog window will open. Once you have entered your phrase click on	Do search and the program will show you all of the news stories containing your word or phrase. The summary bar at the top of the news window will indicate	Search result on <search phrase>. If you open one of the stories shown in the search results you'll see the search word or phrase highlighted, by default, in red. As mentioned earlier in this article you can use Display options to change this colour if you wish. You can then decide to Close & keep the search or	Close & cancel the search. 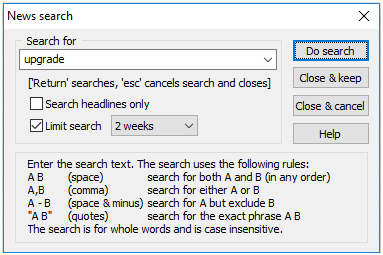 There are two further options, the amount of news you search can be limited to look back 2 weeks, 1 month, 2 months, 3 months or 6 months and you can opt to Search headlines only. 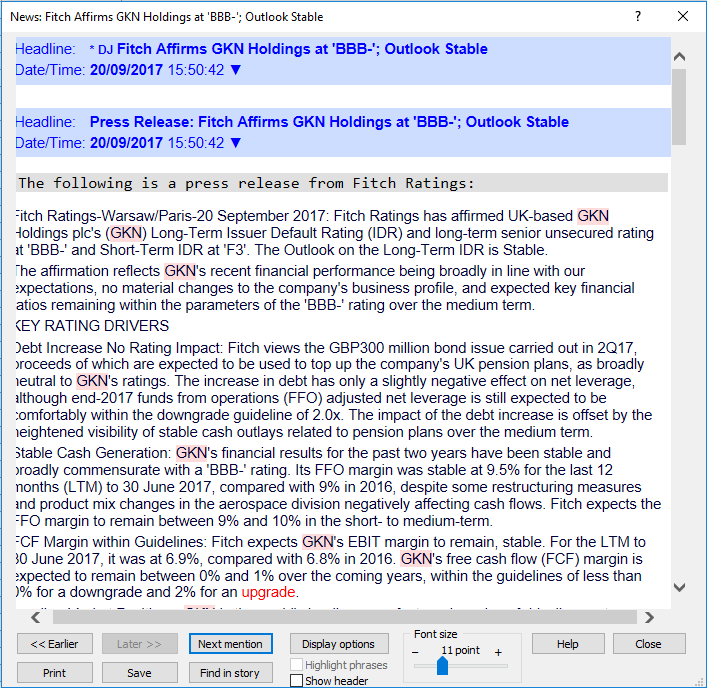 In this example we have search the news headlines for the specific phrase "Form 8.3" which is an RNS notification regarding share dealing and takeovers. Searching the news is a quick way to find stories that you are interested in. Filtering the news is similar to searching but provides additional functionality. To set a filter on the news right click on one of the news stories or click on the News menu. Then select	Set news filter... from the menu. The first time you do this, as you have no other filters, you will be asked to give your filter a name. Once you are happy with the name click on OK. 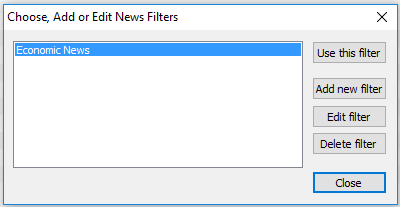 The Create News Filter window will open. This dialog window has two tabs Category search and	Keyword/Code search. 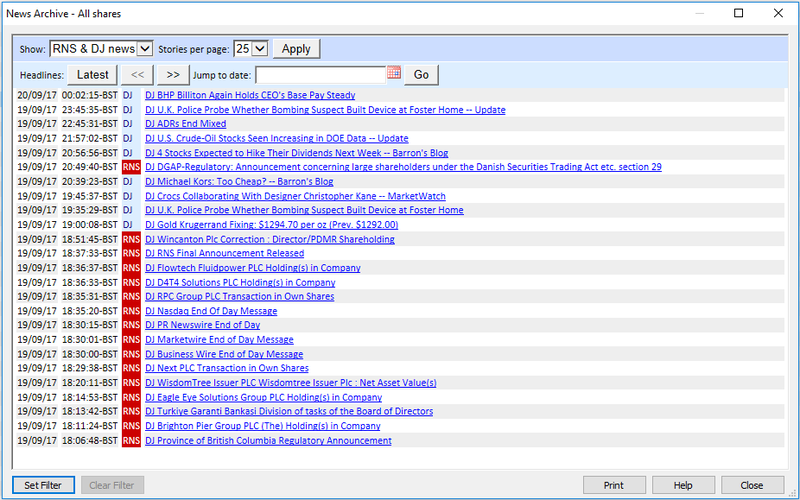 Dow Jones, who provide the news, has a series of codes that they tag each story with. 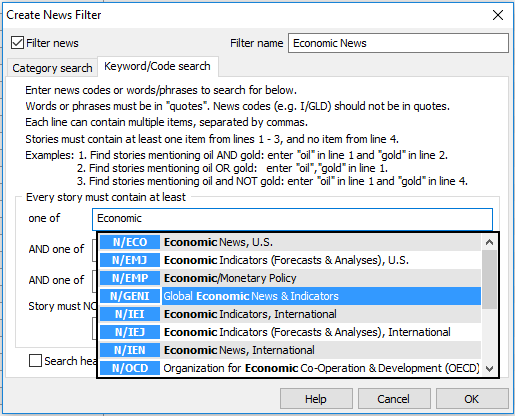 A news filter will allow you to use these codes, words or phrases and filter news for those stories that either include or exclude one or more of these terms. 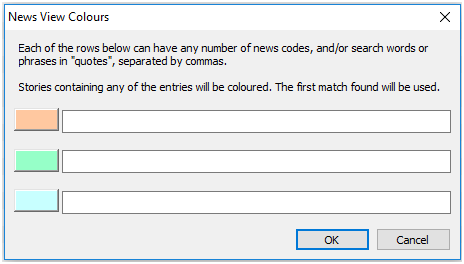 To find codes you just start typing your search phrase and if any codes are associated the database will show them. Once you have selected the code click on OK and the News view will be filtered by your selected criterion. 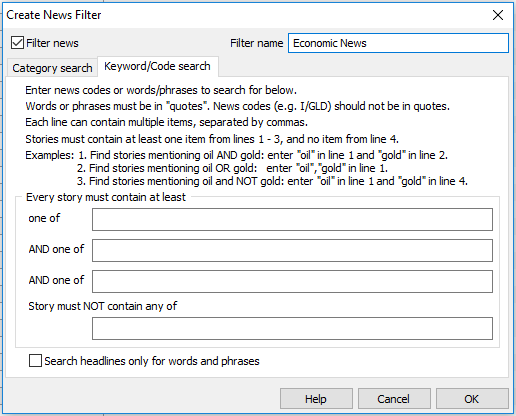 The dialog gives an examples of how you can use AND and OR to create your filter or right click on the News view deselect	Filter News (using 'Filter Name') in the menu. 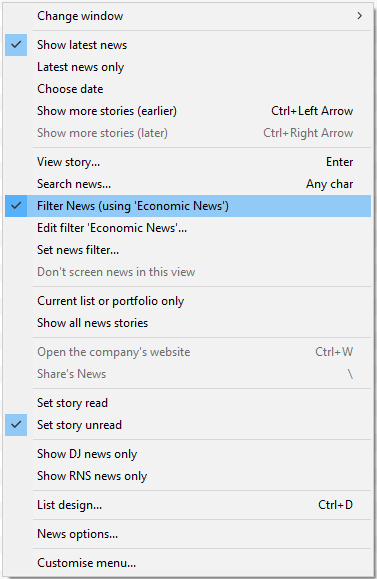 The Create News Filter dialog also shows you how to use	AND and OR in your news filters. 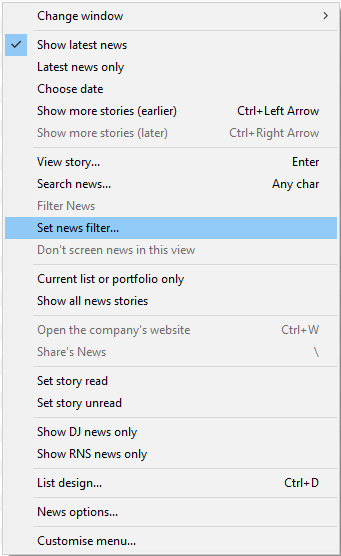 Now that a filter has been created, right clicking on the News view and selecting Set News Filter will open the	Choose, add or Edit News Filters dialog. From here you can use one of the available filters, add a new filter, edit an existing filter or delete one. 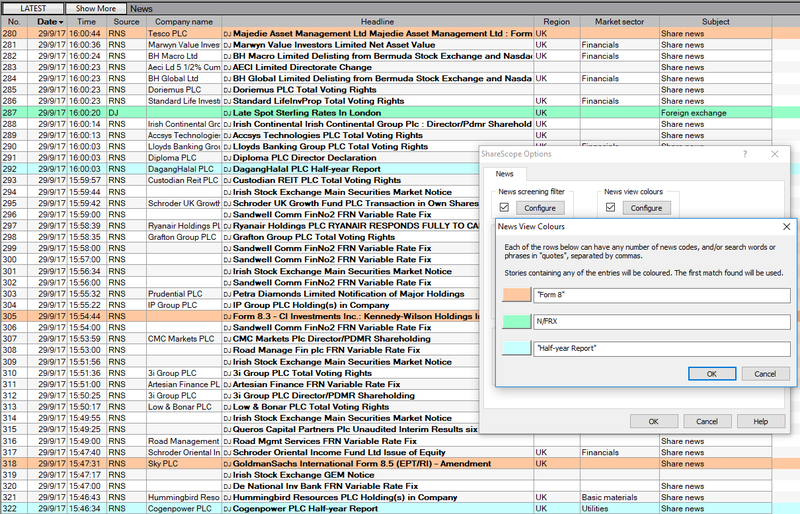 In this example we have created a filter called	Trading Updates. 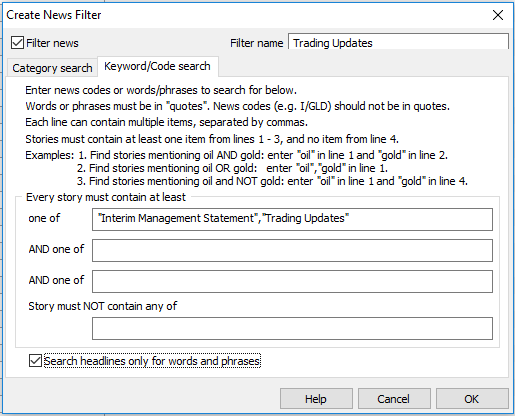 The filter is set to use the phrases "Interim Management Statement" OR "Trading Updates". You can see the comma represent the OR function. Note we have also ticked the	Search headlines only for words and phrases option. The Category search tab allows you to select one or more categories from three lists:	Region, Industry and Subject. 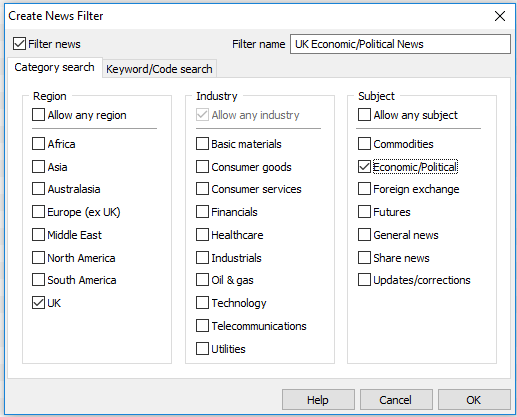 In the example above we have created a filter titled	UK Economic/Political News and set the categories to show us news stories that cover Economic/Political for the	UK. This function allows you to screen the news for certain stories based on Dow Jones news codes, words or phrases and remove them from the feed so that you never see them. For example the Dow Jones news service includes Sports news. If you were not interested in Sports news you can use the screen tool to remove it from the feed. Once you have chosen to exclude these stories they will not appear in your news feed. 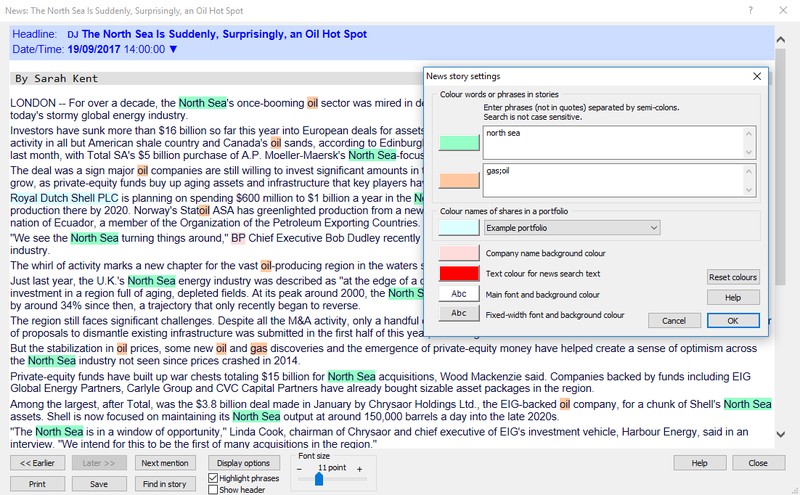 Much like colouring search terms News Views Colours allows you to highlight news stories based on a list of words or phrases. However, the News Views Colours changes the colour of the row in the news view rather than a phrase in the story. Click on the Configure button to open the	News Views Colours dialog window. News Views Colours uses the same methodology as used when highlighting search terms in a news story. Words and phrases must be in quotes and are separated by a semi-colon. Dow Jones codes can also be used. In this example we have used "Form 8" and"Half-year Report" as our search terms and	N/FRX which is the code for Foreign exchange. Get up to n stories initially (a larger number will be slower) - This defines how many news stories are retrieved from our servers when you open the news view. The default is 50 stories. Limit stories in Share's news views to n days old initially - This is an additional limit placed on the amount of news stories that are retrieved from our servers when you open the news view. This would override the first option if this limit was reached first. The default is 15 days. 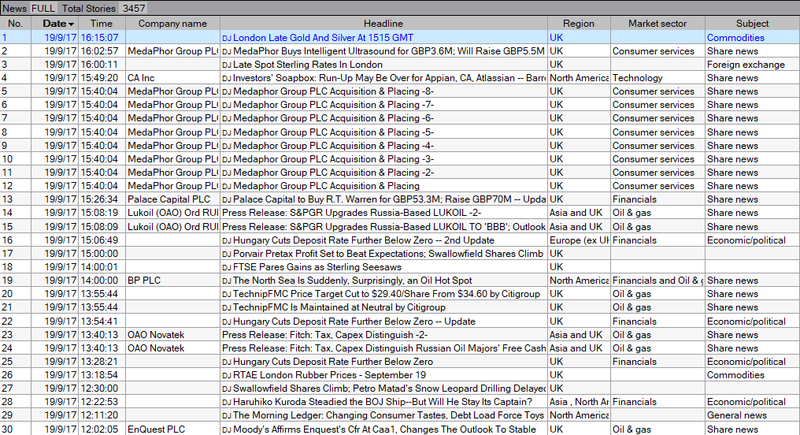 Certain news stories, such as the	UK Calendar of Corporate Events - Month Ahead, mention a large number of shares. The option Don't flag or alarm on stories mentioning more than n shares allows you to exclude these stories from alarms or being counted by the news flags. 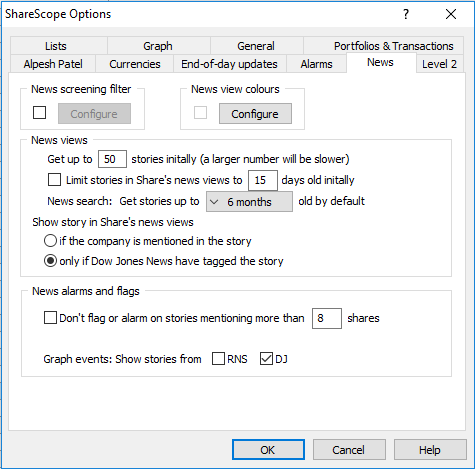 Graph events: Show stories from... - this option allows you to whether the Event flags shown on the graph include RNS stories, DJ stories or both.